Russia Pushes To Grow Gazprom's Reach, Control Even as the global financial crisis pummels the economy, Moscow says it's going ahead with plans for large investments in Gazprom, the world's largest producer of natural gas. The company lies at the center of the Kremlin's strategy to boost control over global energy supplies. One of Gazprom's major projects is construction of a pipeline under the floor of the Baltic Sea that will supply natural gas to Europe. The planned pipeline will extend as far as Germany. Gazprom, Russia's giant gas monopoly, is the world's largest producer of natural gas. The company lies at the center of the Kremlin's strategy to boost control over global energy supplies and, many believe, its political influence. Three years after Russia shut off natural gas supplies to Ukraine and raised fears of an energy crisis in Europe, the same thing has happened again. The crisis brings renewed attention to Russia's huge state gas monopoly, Gazprom, and its role in the Kremlin's foreign policy. A decade of soaring prices fueled the massive economic boom behind Russia's resurgence on the world stage — until now. Oil prices have plummeted from a record in July, and gas prices are predicted to follow later this year. But even as the global financial crisis pummels the economy, Moscow says it's going ahead with plans for large investments at the center of the Kremlin's strategy to boost control over global energy supplies and, many believe, its political influence. In this three-part series, NPR examines Russia's huge gas monopoly — and its role in the Kremlin's foreign policy. Gazprom is the world's largest producer of natural gas. It already supplies a quarter of Europe's energy and is a growing source for consumers in Asia. To many Russians, the state natural gas monopoly is synonymous with the government it helps support. In 2007, Gazprom earned $90 billion and provided a quarter of the state budget. The company's numerous sidelines range from a media holding company to poultry farms. In 2005, Gazprom also became an oil company by buying Russia's No. 5 oil firm from tycoon Roman Abramovich. Key to Gazprom's designs are plans to build two major pipelines to Europe, although Estonia and Finland are delaying plans for one of them. This planned pipeline, the North Stream pipeline to Germany, was originally expected to begin operating in 2010. The two Baltic Sea countries cite environmental concerns for so far refusing permission to lay pipe along the sea floor in their waters. 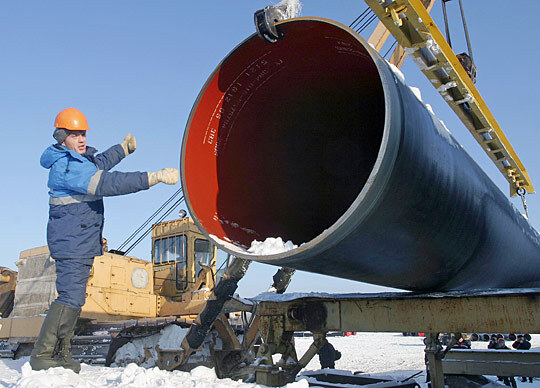 Critics say the pipelines would boost Russia's leverage over its customers. Harvard University's Marshall Goldman says they would act as an "umbilical cord" connecting gas consumers to Russia. After Moscow first shut off supplies to Ukraine during a price dispute in 2006, Western countries accused the Kremlin of using energy as a political tool. 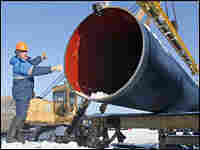 Gazprom hit back at European critics by threatening to divert supplies to Asia. But analysts say the threat was a bluff: Gazprom may control supplies, but it also relies on European customers who pay significantly more than other consumers for their gas. Regardless, Gazprom's plans for new supply routes to Asia are a long way off. A project to build a pipeline to Japan has been indefinitely delayed. At the same time, Gazprom has moved to reduce the amount of gas it sells China to increase the dwindling amount available to Russians at home. The global financial crisis has overshadowed all Gazprom's plans. Until recently, executives boasted their company would become the world's biggest. But a battering on the stock market has knocked off about 75 percent of the company's share value, sending it from the world's No. 3 firm to 35. Still, Gazprom's Alexander Medvedev, deputy director in charge of exports, dismisses questions about whether the crisis has affected the company's plans to sink tens of billions into expanding its export routes. "We have enough money," he says. In the long term, however, the company faces an even bigger problem than a shortage of cash: depleting gas supplies. As 30-year-old gas fields in western Siberia, the company's biggest source, dry up, Gazprom admits it's facing a production decline. Energy experts say the company will probably be able to continue fulfilling long-term contracts with foreign countries, but it will have to cut back on supplies at home — even though Gazprom continues to build pipelines to remote, impoverished regions of Russia as part of a so-called gasification program. Gazprom says it's not worried about future supplies, saying it's spending tens of billions of dollars to explore new gas fields. Among the projects is a giant Shtokman gas field in Russia's Far North. Conditions there are extreme: The field lies under Arctic waters some 340 miles offshore. Moreover, Gazprom plans to sell some of its gas in the form of liquefied natural gas, or LNG, facilities, which are complicated and expensive to build. But experts say perhaps Gazprom's biggest problem is the way its assets and profits are controlled. Shady structures run by secretive businessmen are widely believed to enable Prime Minister Vladimir Putin and his trusted loyalists in government to exert personal control over the state-owned behemoth. One such organization is RosUkrEnergo, a Swiss-registered trading company through which Gazprom sells gas to Ukraine. Fifty percent of the company is controlled by a man the Ukrainian government investigated over accusations he was connected to a major Russian organized crime boss. Kiev says it's long asked for RosUkrEnergo to be cut out of the country's deal with Gazprom — but that Moscow insists on using the intermediary. Another such structure, Gazprom-controlled YugoRosGas, sells gas to Serbia. The company caused a scandal in Belgrade in 2008 after its director Sasa Ilic suddenly raised the price Serbia would pay for Russian gas in 2009 by 60 percent. Ilic was also head of Serbia's state gas company at the time, meaning he had signed the deal with himself. Experts say manipulation of Gazprom's cash flows is even more pervasive back in Russia. Former Deputy Energy Minister Vladimir Milov says he believes some of Gazprom's major assets — including media holdings, an insurance company and pension funds — have been illegally transferred from Gazprom's control to a bank connected to Putin. Gazprom's critics say Western countries must develop a common energy policy toward Russia to stop the company from exporting its murky practices outside Russia. One way to do that, they say, would be to force Gazprom to open itself to foreign investment that would exert pressure on the company to reform. But Gazprom has successfully blocked major foreign investment in its Russian operations even as it buys into European utilities supplying gas directly to consumers. Gazprom has profited from new European Union regulations aimed at breaking up European energy monopolies by snapping up some of their parts in the drive to consolidate its own monopolistic control. It's part of an expansion strategy that appears to have put Gazprom on the winning side in a global struggle for the future of European energy supplies.